Progress M1-10, identified by NASA as Progress 11 or 11P, was a Progress spacecraft used to resupply the International Space Station. It was a Progress-M1 11F615A55 spacecraft, with the serial number 259. Progress M1-10 was launched by a Soyuz-U carrier rocket from Site 1/5 at the Baikonur Cosmodrome. Launch occurred at 10:34 GMT on 8 June 2003. The spacecraft docked with the Pirs module at 11:14:53 GMT on 11 June. 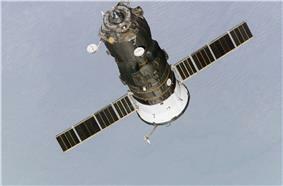 It remained docked for three months before undocking at 19:41:44 GMT on 4 September to make way for Soyuz TMA-3. Following undocking, it remained in orbit for a month, conducting an earth observation mission. It was deorbited at 11:26 GMT on 3 October, burning up in the atmosphere over the Pacific Ocean, with any remaining debris landing in the ocean at around 12:38:49 GMT. Progress M1-10 carried supplies to the International Space Station, including food, water and oxygen for the crew and equipment for conducting scientific research. ^ a b McDowell, Jonathan. "Launch Log". Jonathan's Space Page. Retrieved 2009-06-07. ^ a b c d Anikeev, Alexander. 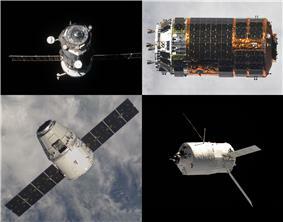 """Cargo spacecraft "Progress M1-10. Manned Astronautics - Figures & Facts. Retrieved 2009-06-07. ^ a b Wade, Mark. "Progress M1". Encyclopedia Astronautica. Retrieved 2009-06-07. ^ Zak, Anatoly. "Progress cargo ship". RussianSpaceWeb. Retrieved 2009-06-07. ^ McDowell, Jonathan. "Satellite Catalog". Jonathan's Space Page. Retrieved 2009-06-07.